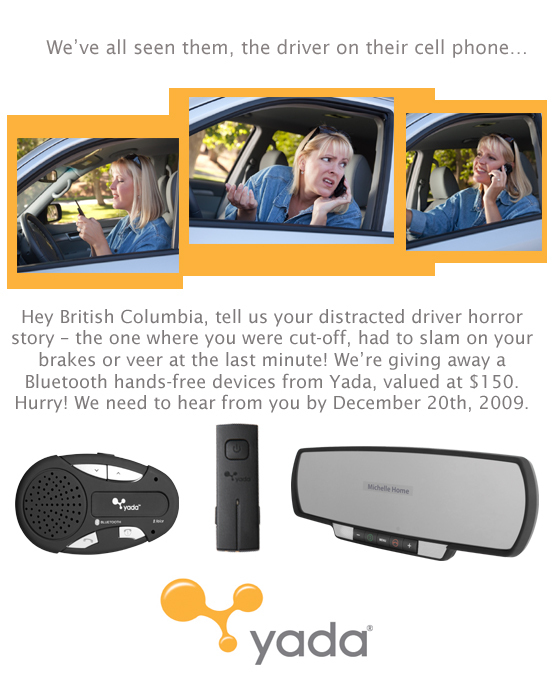 Tell us your distracted driver horror story – the one where you were cut off, had to slam on your brakes or veer at the last minute because someone else just couldn’t keep their eyes and ears off their cell while driving – in the comments below! The best story wins a Bluetooth hands-free device valued at $150 from Yada. But you have to hurry: On December 20th 2009 we’re closing the comments and picking a winner. This contest is only open to British Columbians, but if you’re from out of province and have a story to tell, don’t hesitate to drop it in the comments as well. 1 Response to " The Yada Bluetooth Hands-Free contest "